It’s no secret that women are underrepresented in engineering nationally, receiving 21.3 percent of all engineering bachelor’s degrees in 2017, according to the American Society for Engineering Education. At the University of Delaware, a sorority of women in engineering and technical sciences is doing its part to change that. 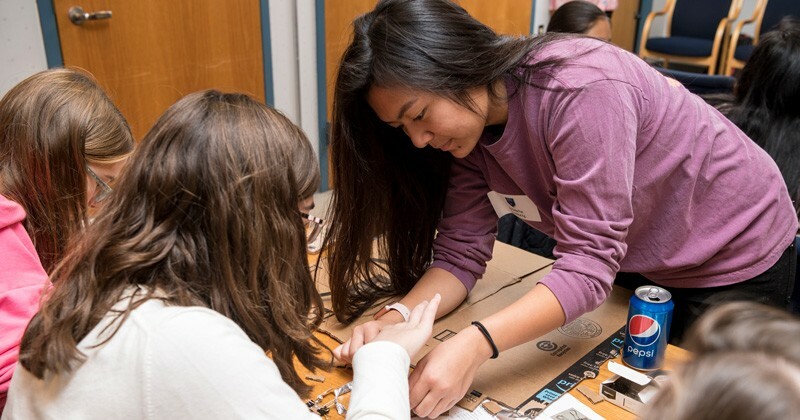 On Nov. 10, the Alpha Omega Epsilon engineering sorority’s Nu chapter at UD hosted a discovery day for high school girls. The goal of the day? Inform female high school students about engineering and computer science, show them opportunities in these fields and highlight the rise of women in STEM careers. The event was open to girls in their sophomore, junior or senior years of high school who are interested in studying science, technology, engineering and math (STEM) fields after graduation from high school. Fifty girls from 26 high schools attended the event, which was held at UD’s Center for Composite Materials. The high school students learned about different types of engineering from Heather Doty, assistant professor of mechanical engineering; Debra Yarrington, assistant professor of computer science; Sue McNeil, chair and professor of civil and environmental engineering; Sarah Rooney, assistant professor of biomedical engineering; Rick Martin, associate professor of electrical and computer engineering; Cathy Fromen, assistant professor of chemical and biomolecular engineering; and Jenni Buckley, associate professor of mechanical engineering. The high school students also participated in a campus tour, a lunch and question-and-answer session with members of Alpha Omega Epsilon and a hands-on activity,Scrappy Circuits, which teaches fundamentals of building and understanding electrical circuits using inexpensive, common materials. Clements knows how impactful this early exposure to engineering concepts can be. Alpha Omega Epsilon member Robyn O’Halloran, a sophomore majoring in environmental engineering, volunteered at the event because she wants girls to know their options. In high school, the Havertown, Pennsylvania, native excelled in math and science and was intrigued by the idea of engineering — except that she didn’t really understand what it was. UD’s K-12 Engineering group, which hosts camps and offers educational units to teachers around the country, also helped with the event.